Self destructive behavior in a person is a weighty problem to try to lift. Self destructive behaviors are frequently outward expressions of deeply rooted mental or personality disorders, such as depression, bipolar disorder or borderline personality disorder. These are serious mental problems, but with devoted efforts, they can be managed and the individual can lead a normal, meaningful life. Consider medication. 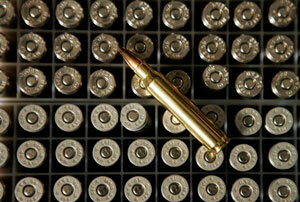 Self destructive behavior is frequently a sign of a serious mental disorder or personality disorder. These can be diagnosed and managed, but medication is frequently helpful to this cause. A number of antidepressants and mood stabilizers are available to help people with disorders balance their brain chemistry and disposition. Seek counseling. Professional counselors are practiced in working with people who struggle with self destructive tendencies. They are equipped to identify the underlying causes of the self destructive behavior and help the individual work on their recovery and regain the positivity in their lives. 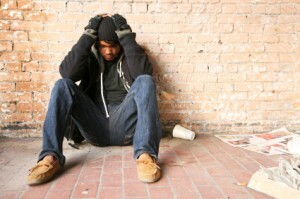 If the self destruction is substance abuse related, seek high quality substance abuse treatment. Practice coping skills, healthy behaviors and positive self talk. Learning to retrain the way your mind operates is essential to ending your self destructive tendencies. A great deal of help with this will come from counseling, but it will be up to you to put the lessons you learn in counseling or self help into practice in your life. Managing triggers and urges to relapse. Similarly, it will be up to you to learn to avoid things that trigger your self destructive tendencies. If substance abuse is your battle, you will need to practice sobriety by staying away from your sources of the substance or substances. If self harm is your battle, you need to urgently remove yourself from any situation that is causing you to want to harm yourself. If you tend to run from positive things because you do not feel that you deserve them, you will need to work particularly hard on feeding yourself positive self talk instead of self deprecating thoughts. Substance Abuse. If you see someone you care about consistently overusing alcohol, tobacco products, prescription drugs, recreational drugs or even food in a way that is putting them at risk, you can consider them self destructive. If they are aware of the danger to their health but continue to abuse the substance, it may be time for you to intervene and encourage them to see a counselor, or even arrange a professional intervention for them. Self Sabotage. A self destructive person will possess behaviors that sabotage their own well being. These behaviors can be harder to spot than something conspicuous like self mutilation or alcoholism. One has to be relatively close to the individual to pick up on these more subtle behaviors. They tend to take the appearance of ending romantic relationships that appeared promising for seemingly no reason, turning down job offers or quitting high reward jobs for seemingly no reason, or passing up other great opportunities, typically with weak reasoning. Self Harm. One of the most obvious and alarming qualities a self destructive person may possess is that of self harm. This may include suicide attempts or any form of self mutilation. This typically comes with severe self destructive tendencies that commonly indicate a mental disorder or personality disorder of some sort. This is an overt self destructive behavior that can be considered an urgent cry for help. 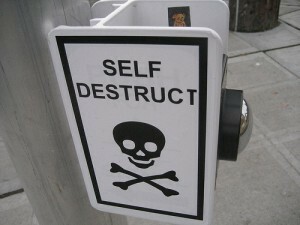 Why do People Self Destruct? It can be very painful to watch someone you care about self destruct. It can also make you feel very desperate and powerless to stop the harmful behavior. Witnessing someone you love self destruct will always leave you with more questions than answers as their behavior seems like pure senselessness to you. However, you are not alone, and neither is the self destructive person. Self destruction is a common expression of a person’s mental health problems that outwardly take the shape of deliberately ruining one’s own life. Though it is entirely needless, the self destructive person is acting out in response to very real stimuli that their mental health problems thrust upon them. If their mental health problems are accurately diagnosed, a self destructive person’s negative tendencies can be managed. This requires the person to want to manage their self destructive tendencies as many people do not grasp how badly they need to manage them. Common mental health diagnosis’ that can spawn self destructive behaviors are depression and bipolar disorder. Mood altering disorders of any kind can initiate self destructive behaviors, but particularly ones that involve depressive effects on moods. These mental problems promote despair within the individual as well as the tendency to want to throw in the towel and give up before even trying. This sense of despair and self deprecation is what leads to self destructive behaviors. Sometimes mental health problems go undiagnosed, either because the person and their loved ones have learned how to function with them or because they simply did not know to seek a diagnosis. Self destructive behaviors will ensue just as persistently in people with undiagnosed mental disorders as those who are diagnosed, sometimes even more so. Without a diagnosis, self destructive behavior may become a way of life for the individual, putting them at greater risk of suffering the consequences of self destructive behavior. If someone in your life is showing signs of self destructive behavior in the form of substance abuse, harming themselves or simply giving up on life, their well being may depend on your encouragement to seek help. Do not stay silent. Intervene if you must.